9 years 14 weeks ago. 9 years 19 weeks ago. 9 years 27 weeks ago. 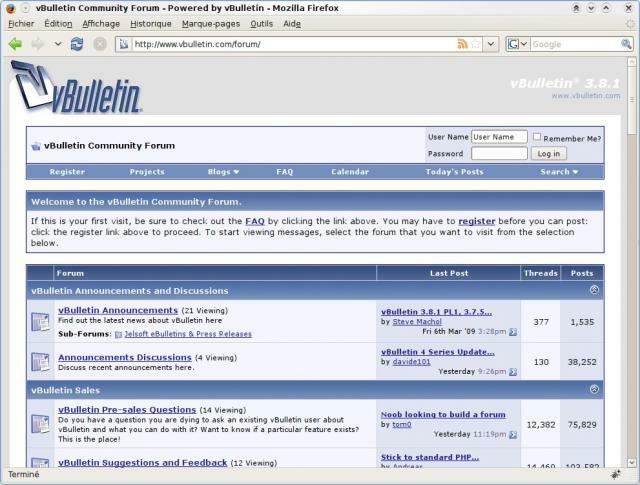 Need to Host your vBulletin 3.8 Forum? A problem with vBulletin 3.8? February 9, 2010: vBulletin 3.8 is outdated and a new version has been reviewed. vBulletin is the most used commercial solution for managing and supporting forum software. It relies on PHP and MySQL, and is clearly one of the most complete solution existing on the market. vBulletin is edited by the Jelsoft Enterprises Limited company for more than nine years (started in 2000), and, step by step has been completed by many additional features and evolve with the Internet. We could notice, on the Big Boards website, that 8 forum on the 25 most used Internet forum are using vBulletin, which proves that you could rely on this software. Owned License ($ 180): Allows you to run the software on your site indefinitely. One year of free updates, and $60 to a new year of updates. Leased License ($ 100): Allows you to use the software on your site for 1 year and gives you access to products updates for that year. After 1 year, you must renew your license or remove the software from your site. vBulletin 3.8 is recommended for Huge Community. Languages supported by vBulletin 3.8.
vBulletin provides a localization features that could virtually make it work in any languages... if you translate it. Translations packages are of course also available. The vBulletin software only supports the MySQL database backend, but it supports it well. This means that using the direct PHP/MySQL functions and optimizations is always better than using a third-party wrapper, because it allows using MySQL hints. However, it could be installed on any operating systems that support PHP on a Web Server. vBulletin has an incredible list of features. They are not all useful, simply because any installation of vBulletin never requires the default huge features list it provides. However, everybody will always fulfill their needs, generally without installing any additional plugins. Some details about vBulletin 3.8 features regarding members. The default Forum Software Reviews list of features is not enough complete to list the vBulletin software provides. The "User Infraction Manager", that is a more powerful way to the basic user banishment, and notify users that does something authorized. The "RSS Manager", that allows customizing what is syndicated. "Threads Tags", that helps classifying topics. "Similar Threads", that provides an estimation of threads that could match to the same topic of the current thread. Convert an existing forum to vBulletin 3.8. Secunia Advisories severity affecting vBulletin 3.8. Secunia Advisories impact affecting vBulletin 3.8. The first place in terms of robustness and efficiency makes vBulletin having an everyday increasing list of plugins, tools and tips about integrating it to existing Web softwares, like CMS for example. We also have to note that vBulletin provides by default many bundled softwares (Pictures Manager, Blog, Bug Tracker,...) which prevents asking the question if it could be integrated to a software that provides the same features. The template editor, the scheduled tasks manager, the localization tools,... also makes it being absolutely complete and really more potentially powerful than its open source competitors. Does vBulletin 3.8 correctly follow (X)HTML and CSS norms? The W3C norms are respected, even if the XHTML 1.0 and the <table> layout start to be a little be outdated, and more complex to theme. Forum and Threads Tags, that helps classifying topics. Similar Threads, that provides an estimation of threads that could match to the same topic of the current thread. It's clear, vBulletin is the most used forum software on Internet, and there are tons of reasons for this. First, vBulletin is really powerful, fast, easy to use and have a classic look of a forum software. Secondly, vBulletin has an impressive list of features and provides by default all additional tools a website could need (blog, project manager,...). We could however notice and deplore that even if vBulletin provides many bundled softwares, they always have the look of the vBulletin them, and give the feeling that it's nearly always a kind of thread and topic layout, with some additional features. This is of course false, but the feeling stays. The software is really well supported and regularly patched by its editor, which is really reassuring for this kind of software. Finally, even if vBulletin is not perfect and is quite expensive (compared to an open source forum software), it is so impressive, well developed and powerful that Forum Software Reviews, for the first time, give it the Perfect Rating. Experiment the vBulletin 3.8 Demo. Compare vBulletin 3.8 vs PhpBB 3 vs Simple Machines 2. Ask your questions to the vBulletin 3.8 Community Forum. Get Users Reviews about vBulletin 3.8 and Share your experience. Is it possible to use the vBulletin forum as a membership forum with restricted access for members only? Is there a "best practice" solution to giving/closing access for members according to payments received? In vBulletin Features, "Admin Control Panel Features" section, a Paid Subscriptions, which includes payments through PayPal, WorldPay, NOCHEX and Authorize.net is available, and it works really well. My company wants to use Forums and blogs.And we are using Java for our existing code which has all other features other than blogs and forums.Is it posiible to integrate vBulletin with our code and use the features? Our current environment has the following - MSSQL,Apache Tomact,IIS server,Java. If you are in a Tomcat environment, I think you should use JForum, or an hosted solution. They will perfectly match your needs. Can the application be customized to allow for several ad buttons to be placed at the top of the forum and on the left or right side. Would the customizing need to be done by you or could a person with code knowledge do it? You will need someone with poor HTML knowledge, but the template manager already manage your kind of request, so this is quite easy. I am very interested in buying the software , but code is not something I fully understand. Do you offer a service where you can download the software onto a server I get to host the site? I asked about puting some ad buttons on the forum before you said it was simple, will I need to change code to apply the ad buttons? Can anyone help me integrate a my WP blog header/banner including menu tab and links to appear on top of the VBulletin forum pages? I'm using css php and I'd like to do this project without using frames. There are sites out there that have done this, but I am having a hard time with it so I'll pay someone that has done it before to show me how to do it. Can someone help me to integrate my head Blog banner menu VP / tab, including the links that appear at the top of the pay page help? I use PHP and CSS, I would like to do this project without the use of frames. There are sites out there that have done it, but I have trouble with it, so you have to pay someone who has done it before to show me how.